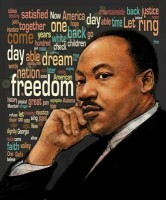 “I Have a Dream” – The Life and Times of Martin Luther King, Jr. Chronicles the phenomenal impact of Dr. King’s life as he becomes one of the most influential and charismatic leaders of the American century. Inspired by the arrest of Rosa Parks, Dr. King becomes the prime mover behind the Montgomery, Alabama bus boycott, putting the philosophy of nonviolent protest to work. He gains national recognition and becomes the dominant force in the Civil Rights Movement during it’s decade of greatest achievement. Students will he stirred at the reenactment of his great “I Have a Dream” speech. This great leader’s struggle and his dream of ” lifting our nation from the quicksand of racial injustice to the solid rock of brotherhood” is a story of inspiration for us all.